Remembering Tom Petty On World Cafe : World Cafe Listen back to an interview and performance from the late rocker, plus a conversation about his influences. Tom Petty performing live at Wells Fargo Center in Philadelphia, Pa. in September 2014. 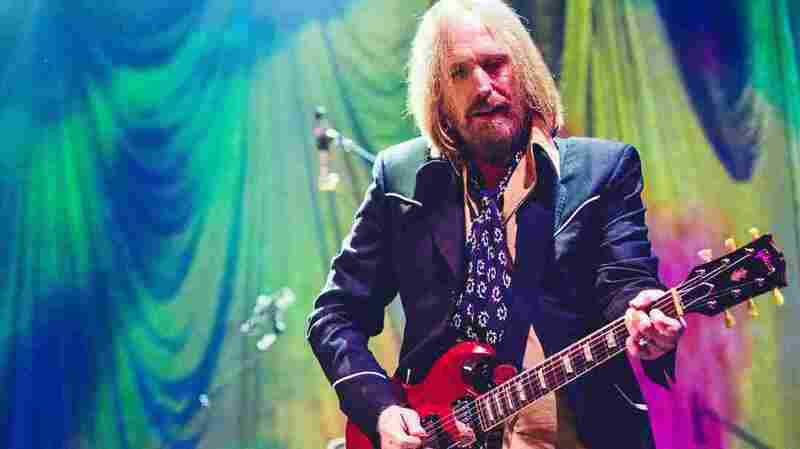 The music world was stunned today by the death of Tom Petty, the voice and pen behind some of the most memorable, unifying songs in rock 'n' roll history. Today we remember his time on the World Cafe with two sessions from our archives. You can listen to a Cafe session and interview with Mudcrutch, the five-piece band that got Petty and friends on the road to rock 'n' roll in the early '70s, who then reunited for a second LP and tour in 2016. We also have an intimate exploration of Petty's work with author Warren Zanes, who sat down with David Dye in 2015 following the release of his book Petty: The Biography.